The reversing latch holds the existing direction and compares it with the requested direction. If the two conflict, the controller ramps down to zero speed and when this is detected, the latch changes state. The latch uses mainly CMOS chips and just occasionally the chips concerned go into high frequency parasitic oscillation so that the direction latch cannot make up its mind which direction it should be in, so the controller ‘sticks’ at zero speed as it is going from (usually) reverse to forward. This modification was incorporated in the board with issue 16 so applies only to issue 15 and earlier. The problem is very rare. 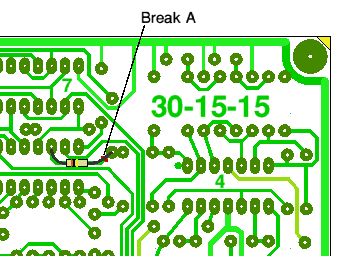 The diagram shows an issue 15 board. Disconnect the battery. Leave the ignition switched on for 1 minute to discharge the main capacitors. Remove the top control board. Break the track indicated at A, below. Solder across the break a resistor, 100K subminiature (CR16 size) is easiest. Do not attempt this modification unless you are proficient: 4QD can accept no responsibility for controllers that have been modified and the publication of this information does not constitute permission to perform it!